Caution - This procedure requires that you handle components that are sensitive to ESD. This sensitivity can cause the component to fail. To avoid damage, follow antistatic practices as described in ESD Measures. This procedure can be performed by customers. The system must be completely powered down before performing this procedure. See Cold Service, Replaceable by Customer for more information about cold service procedures. Power off the server and disconnect all power cords from the server power supplies. See Remove the Top Cover. Locate the PCIe card filler panel that you want to remove. 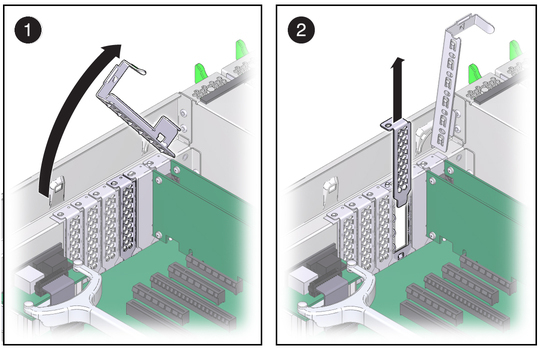 See Rear Components for information about PCIe slots and their locations. Remove the PCIe card filler panel by completing the following tasks. Disengage the PCIe card slot crossbar from its locked position and rotate the crossbar to an upright position. Carefully remove the PCIe card filler panel from the card slot. Caution - Whenever you remove a PCIe card filler panel, replace it with another filler panel or a PCIe card; otherwise, the server might overheat due to improper airflow.